If you’re ever speaking to Michael Dent, from aloe-aloe, there’s a four lettered word he doesn’t like to hear: it’s best to never mention ‘Vera’. 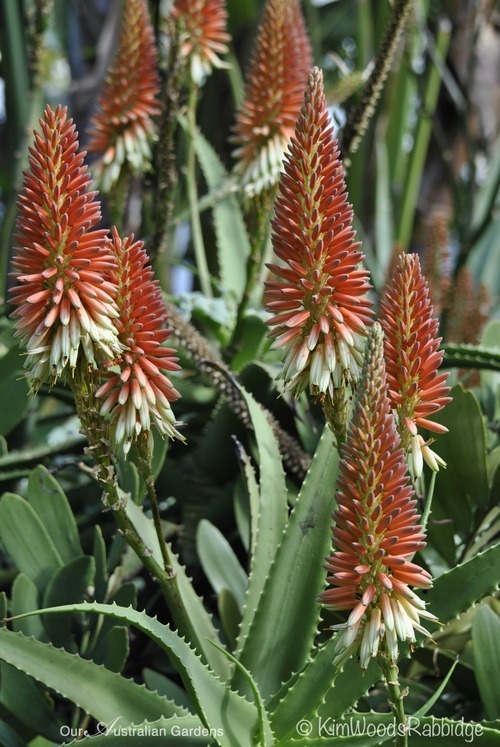 When people say they know all about aloes they often refer to aloe Vera – so it’s easy to understand his frustration. 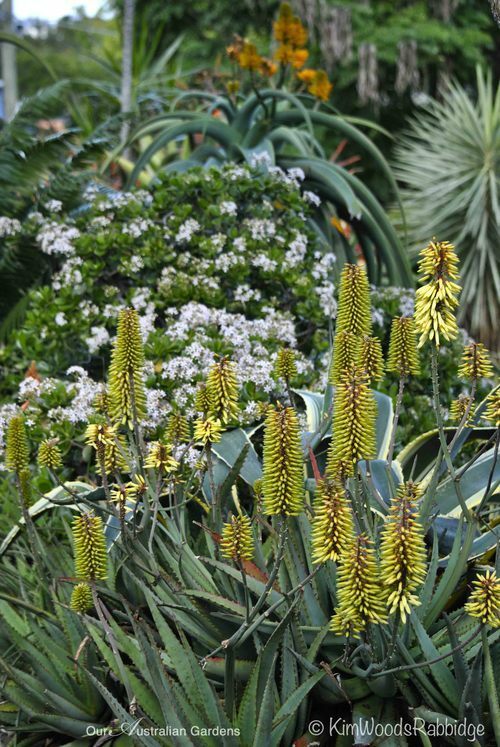 The range of hybrid aloes introduced by Michael to Australia, bred especially for their spectacular flowers, leaves scruffy cousin Vera in the shade. Michael and his wife Alexandra, who live in a Brisbane cottage built in 1876, immigrated from South Africa twenty five years ago. 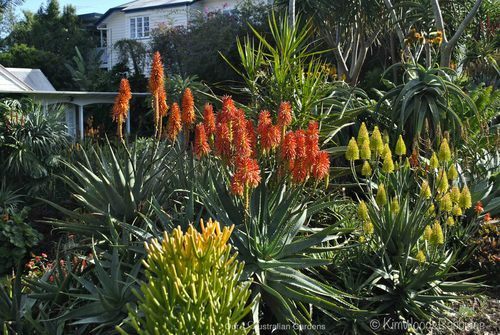 His life-long love of gardens was the catalyst for leaving a safe career as a chartered accountant for the challenging importation and development of South African hybrid aloes. 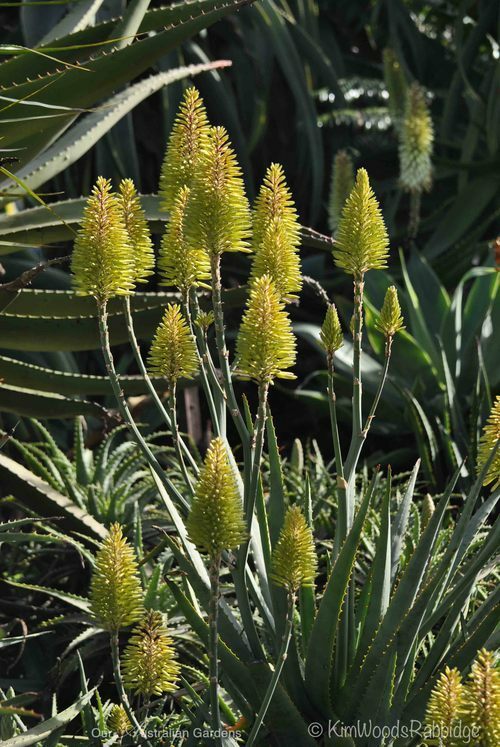 He’d remembered the beautiful aloes he’d known as a child. “I kept thinking how suitable they’d be for Australian conditions,” he says. 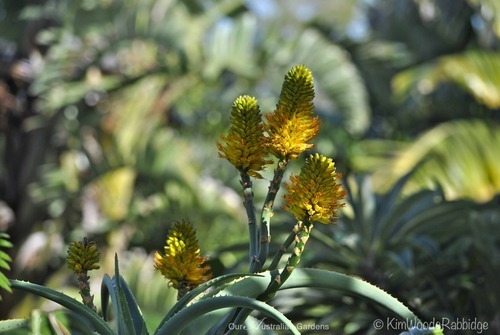 After years of research and complying with importation requirements, Michael introduced a selection of fabulous flowering cultivars from a South African breeder. 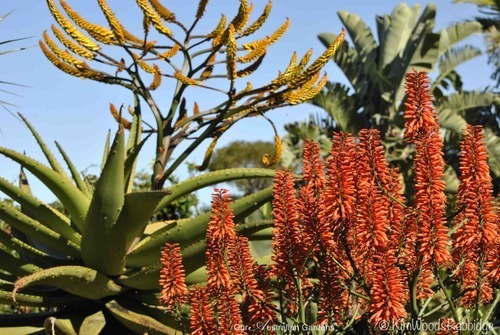 However, just as many of our own plants need protection from exploitation and threatened extinction, so do aloes – significant South African species. Even though his imports are specially bred hybrids, requirements are stringent. “The permits needed to export are the same as those used for elephants and lions!” Michael notes. 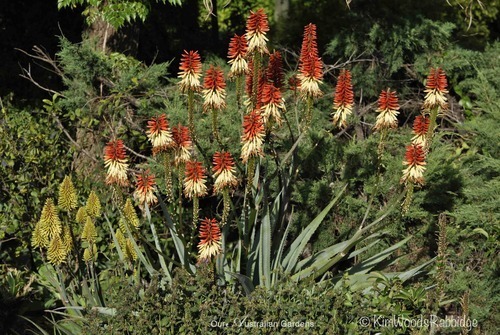 Aloes are so versatile! 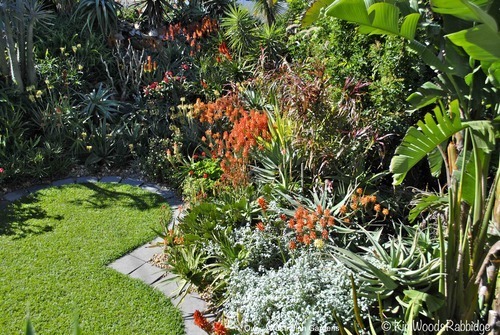 Growing from alpine to arid zones, they suit cottage gardens, to stylish architectural platforms, or xeriscapes. 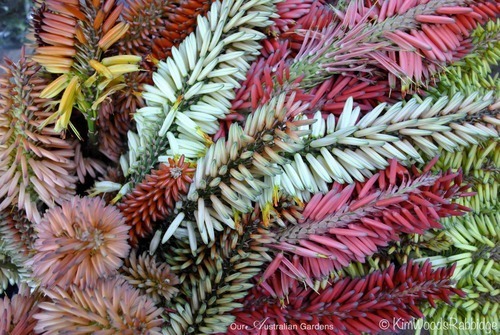 The Dents exciting 23m x 40m garden, ‘Taringa House of Colourful Aloes’, reveals a striking selection of plants chosen for their texture, form and colour. 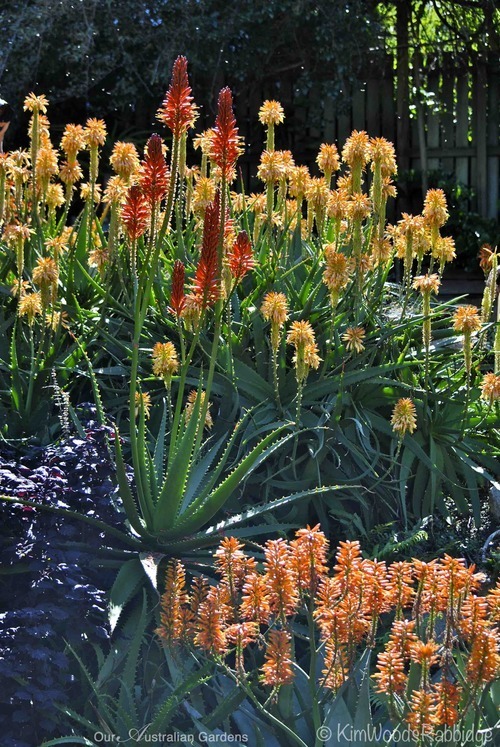 There are hundreds of gorgeous, warm-hued aloes including some yet-to-be launched. ‘Big Red’ taking centre stage. 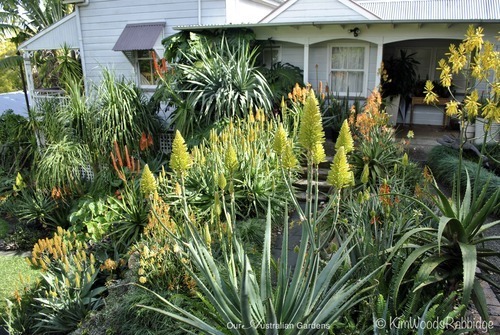 The garden drama begins along the nature strip. 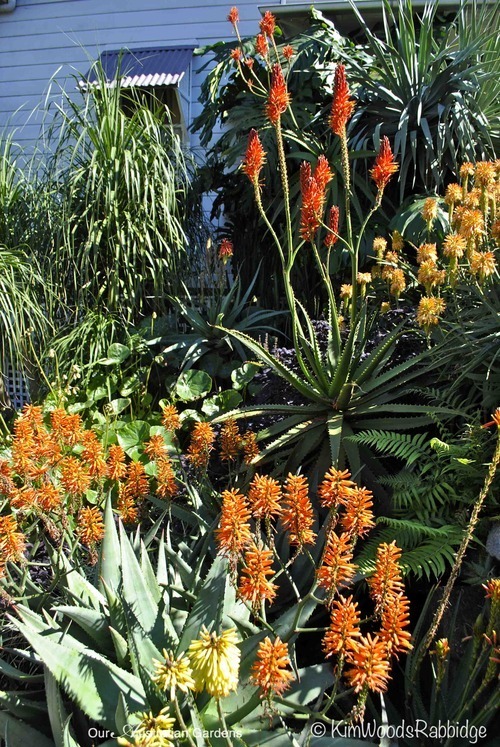 Hot orange and red flower spikes rising from fleshy-leaved rosettes ensure a warm welcome. 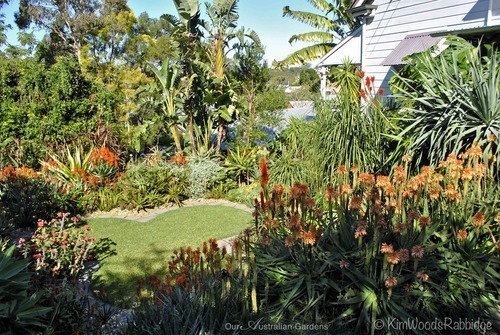 Companion plants include Australian grass trees – Xanthorrhoea and Gymea lily, Doryanthes excelsia. 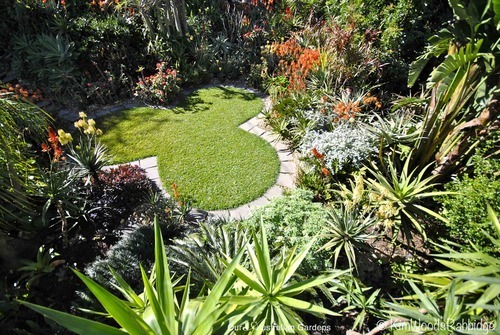 Where a huge Chinese elm once towered over the front garden, stone and boulder terraces now form an amphitheater around a manicured, cloverleaf pocket of lawn. 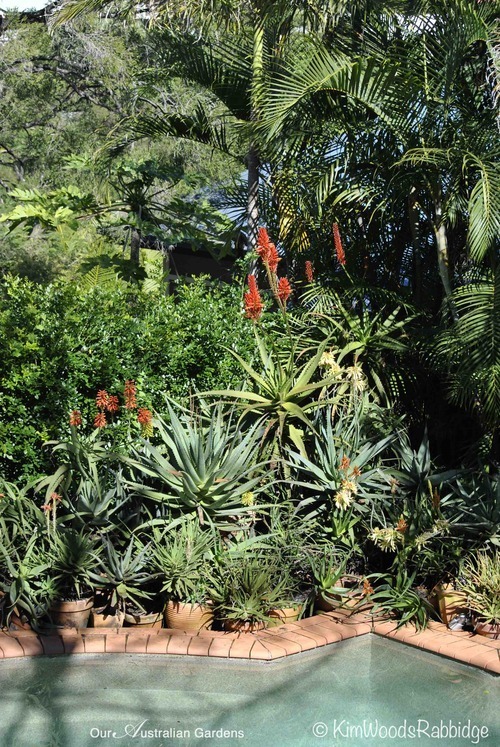 Terraces successfully simulate the natural growing environment of many aloes as well as other plants benefiting from the free-draining locale. Charcoal concrete stepping-stones set amidst river pebbles ascend the terraces. 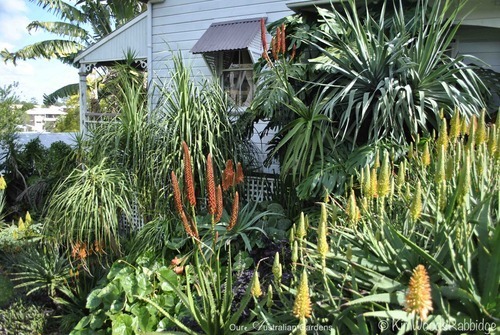 Arresting vignettes are created by plant patterns. 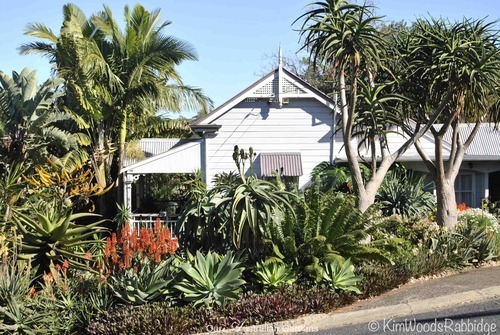 Cycads, Dracaena draco, euphorbias, tulbaghias, rhoeos, Jatropha podagrica, agaves and pachypodiums make appealing companions, as does the hardy Carissa with its shiny deep-green leaves. At the back of the property, deciduous trees provide welcome summer shade and radiant winter sun near the pool. 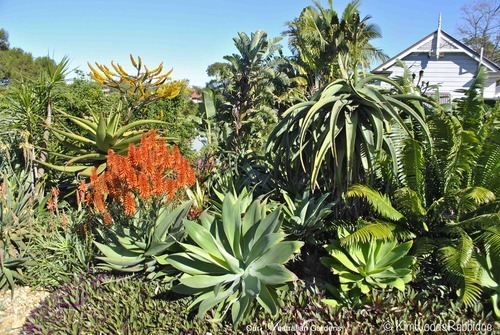 Tropical shade lovers thriving include Zamioculcas zamiifolia, dracaenas, chloroyphytum and bromeliads – all have low water requirements. 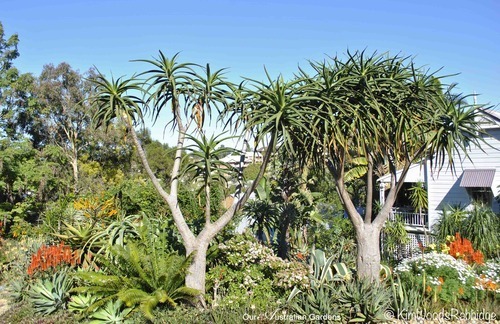 Tree aloes – now they are a statement. What’s for lunch? 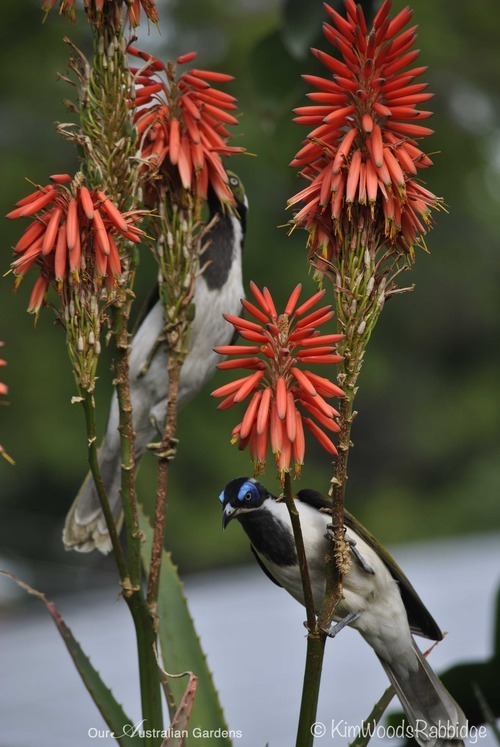 Blue-faced Honeyeaters enjoying ‘Nectar of Super Red’. During the day activity can be feverish with birds flitting from spire to spire, sipping on sweet nectar, while others feast on insects. 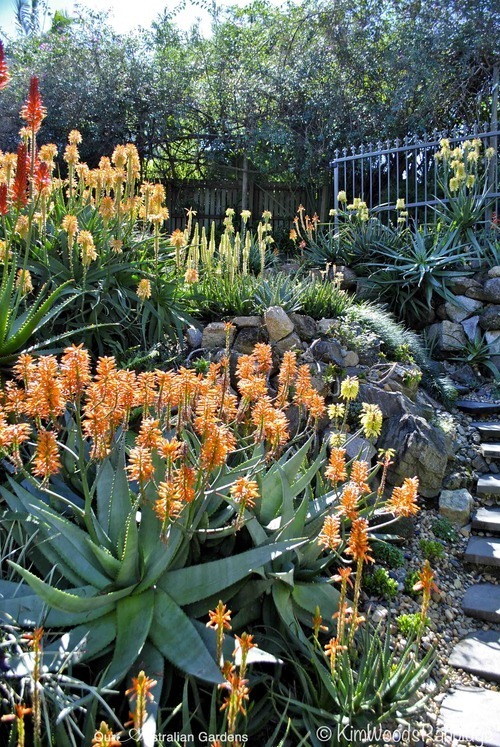 Flowering aloes in the garden range from tiny Fairy Pink at 0.2m to Aloe Big Red, which grows nearly 2m. ‘Capricorn’ – pretty en masse. ‘Erik the Red’ (cool name!) 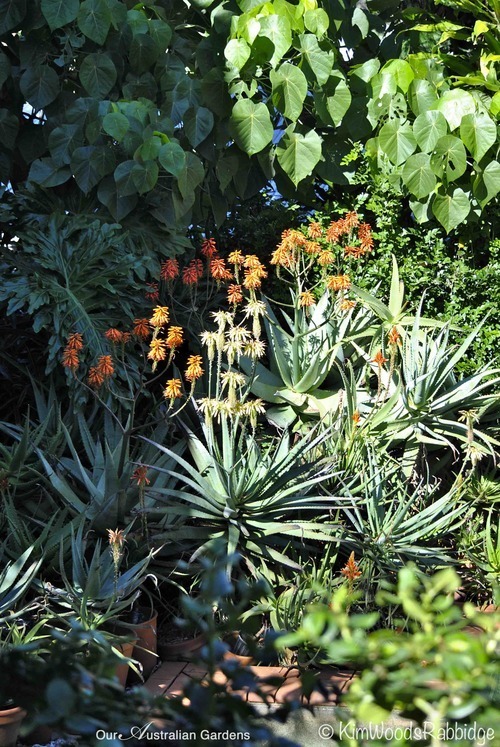 and ‘Outback Orange’. 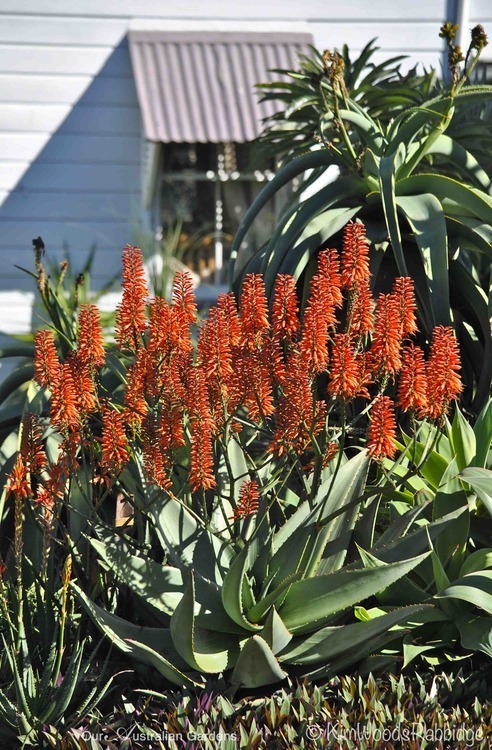 Hybrid aloes are suitable for both hot and cold climates. While their water storage capacity ensures resilience in dry times, they also love rain and with good drainage do remarkably well in many environments. 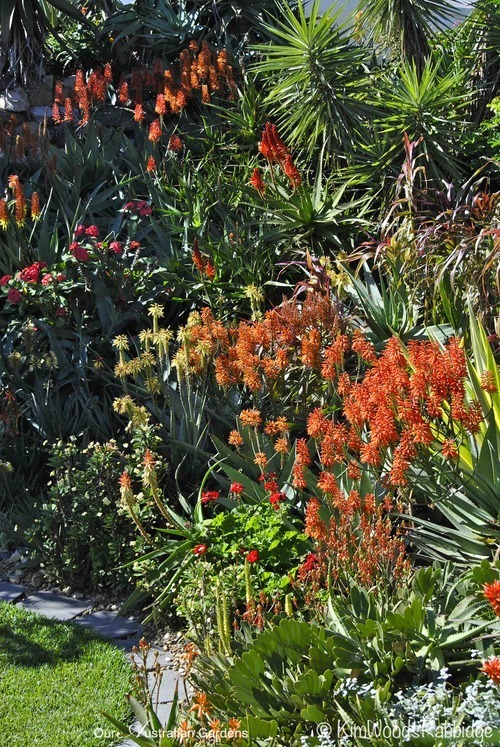 The garden’s appealing year-round, however from autumn through to spring it’s ablaze when masses of blooms brighten the landscape like a kaleidoscope. Hot hues, from pale cream, yellows, oranges, pinks, reds and bi-colours are perfect tonic for winter blues. 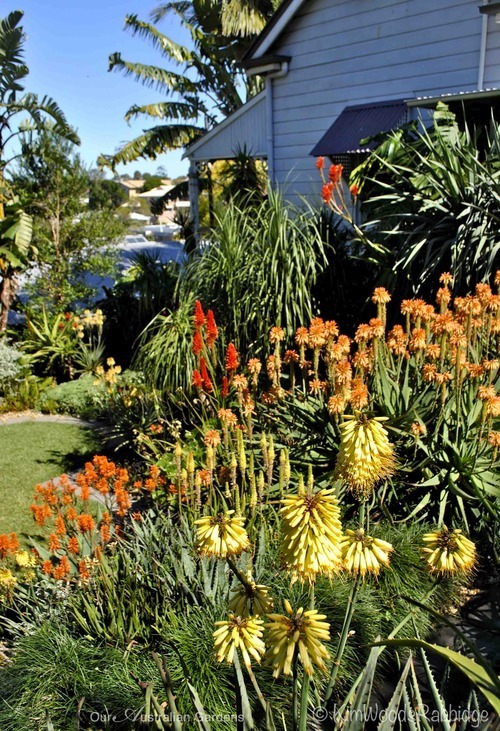 The sunny colours cheer up both gardens and gardeners. P.S. Just a reminder… shhh, don’t mention Vera. Aren’t they effective!!! I love the the lemon/yellow ones.